Blowout Sale! Free Shipping Included! 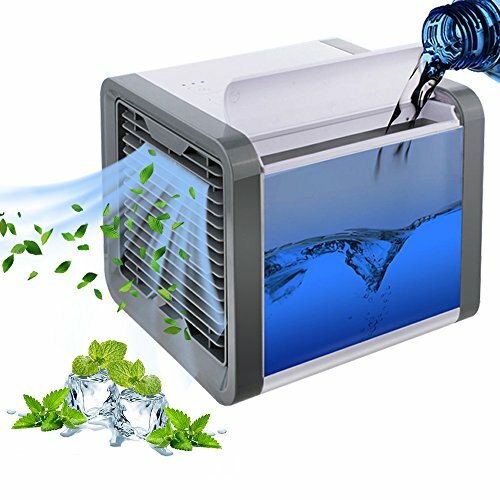 Save 62% on the Air Conditioner Portable Air Conditioner Personal Space Air Cooler Mini Portable Space Air Conditioner, Portable Space Cooler for 45 Square Feet, Desk Table Fan for Office Home Outdoor by PLZ at Pacs BG. MPN: 43272-6691. Hurry! Limited time offer. Offer valid only while supplies last. ❄Non-Freon and Energy Saving❄ Air conditioner consumes only about 10W of electricity. This Mini Air Conditioner Fan is LOW ENERGY CONSUMPTION as a simple small circular fan, much cheaper than running a Freon Air Conditioner in hot summer days. Freon Free, Energy Efficient & Eco-friendly! Patented evaporative technology (draw in hot air and pass it through a wet filter), 100% safe for children and pets. Without any concerns when using this air conditioner fan. ❄Built-in 7 colors LED Mood Light❄ Air cooler fan has 7 different LED colors option, choosing your favourite one can help with the better sleep, can be used as a soothing night light too. Desktop cooler also can be set to color-cycle mode or turned off with the touch of a button. Easy to operate, simply fill with water, plug it into USB port or power bank and the three-speed fan will start blowing. If you have any questions about this product by PLZ, contact us by completing and submitting the form below. If you are looking for a specif part number, please include it with your message.